New utility-scale solar projects totalling 2.1 gigawatts have locked into agreements to connect with the Texas grid in 2019, or enough to more than double the system’s solar capacity, with even larger amounts in store for 2020, according to a Feb. 5 report by the Electric Reliability Council of Texas Inc. While Texas is known for leading the nation in wind-powered generation, solar is gaining a meaningful role, poised to top 6 gigawatts next year from less than 200 megawatts in 2014. 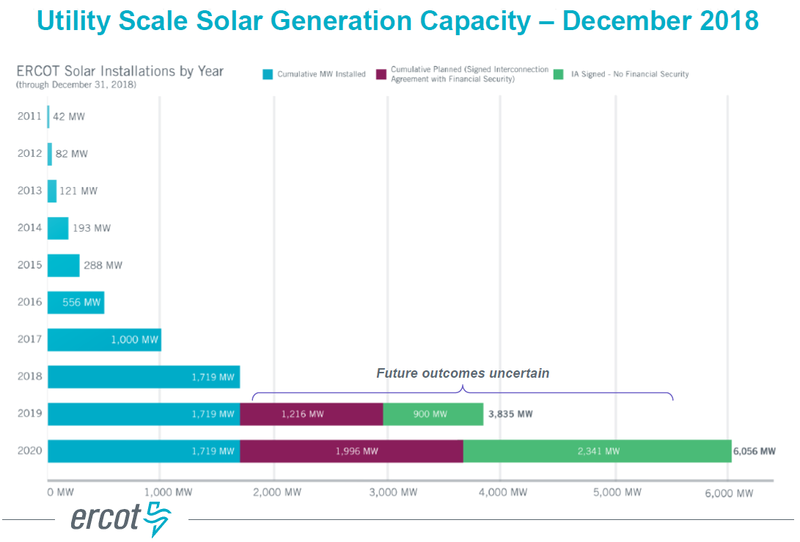 As for wind, the grid operator had about 21.8 gigawatts of installed capacity last year, and about 14.3 gigawatts of new capacity in the interconnection queue with agreements signed through 2021. On Jan. 21, the ERCOT territory set a new wind generation record producing 19.7 gigawatts, breaking the previous mark of 19.2 gigawatts set on Dec. 14, 2018. The generation share from wind has increased every year, reaching 17 percent of the power mix in 2017, up from 15 percent in 2016, according to the annual market report released by ERCOT’s market monitor.